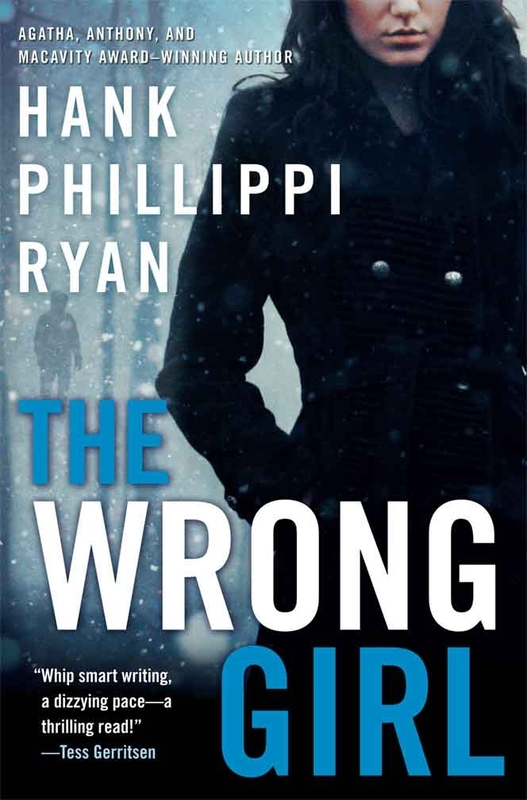 HANK PHILLIPPI RYAN on Right and Wrong in Debut Promotion + GIVEAWAY of THE WRONG GIRL! HANK PHILLIPPI RYAN is the on-air investigative reporter for Boston’s NBC affiliate. She’s won 30 Emmys, 12 Edward R. Murrow awards, and dozens of other honors for her ground-breaking journalism. A bestselling author of six mystery novels, Ryan has won multiple prestigious awards for her crime fiction: the Agatha, Anthony, Macavity, and most recently, for THE OTHER WOMAN, the coveted Mary Higgins Clark Award. National reviews call her a “master at crafting suspenseful mysteries” and “a superb and gifted storyteller.” Her newest thriller, THE WRONG GIRL, is a Boston Globe bestseller and was dubbed “Another winner” in a Booklist starred review. She’s on the national board of Mystery Writers of America and 2013 president of national Sisters in Crime. In THE WRONG GIRL, Boston newspaper reporter Jane Ryland begins to suspect that an adoption agency is engaging in the ultimate betrayal—reuniting birth parents with the wrong children. Meanwhile Jake Brogan and his partner, investigating a young woman’s brutal murder seems a sadly predictable case of domestic violence, one that results in two toddlers being shuttled into the foster care system. Then Jake finds an empty cradle at the murder scene. Where is the baby who should have been sleeping there? Jane and Jake are soon on a trail full of twists and turns that takes them deep into the heart of a foster care system in crisis and threatens to blow the lid off an adoption agency scandal. THE WRONG GIRL is a riveting novel of familial relationships—both known and unknown—vile greed, senseless murder, and the ultimate in deception. What if you didn’t know the truth about your own family? Hank has offered to send a copy of The Wrong Girl to one lucky commenter; details are at the end of this post. What do you wish you’d done differently for your debut novel? This is fun to think about, because I had the opportunity to debut twice. My first book PRIME TIME came out in a Harlequin imprint in 2007. It did really well, so in 2009, MIRA reissued it and FACE TIME as single titles, followed by AIR TIME and DRIVE TIME. So, essentially, PRIME TIME came out twice. The first time, I was so clueless, I cannot even begin to tell you how clueless. If I had to do that over, I would spend less money on cute promotional pencils and one-sheets. I guess. I wonder, now, if any of that made any difference. I was so eager to sell books, I was spending a lot of money on promotion, without the benefit of any real guidance about what was reasonable. You feel so tempted to do ANYTHING to sell that book—and it’s easy to spend a lot of money. I wish I had some sort of equation of guidance now to tell you what “worked.” When the reissue of PRIME TIME came out in 2009, I did not make pencils. However, I am a big bookmark person, and insist good bookmarks with real info about the story are must haves. I can tell you—I personally hand them out to everyone at every event. What do I wish? I wish I would have realized that being worried and frantic is worthless, destructive, energy-sucking, and silly. Drove myself crazy with Amazon rankings and numbers. Whoa. That way lies crazy city. I wish I would have remembered to have more fun. It’s a dream come true moment, and that is too easy to forget. And hey—DRINK the champagne people give you! What’re you saving it for? If you have any specific questions, debut-ers, happy to try to answer! What did you do exactly right with your debut? I’m lucky that I realized that every single event, huge or tiny, can be important. Every single person who talks to you or looks at your book can change your life. If you see it that way, every day is a treasure and every event is wonderful. I promised myself I would never complain, would take a moment every day to realize I was lucky, and would do my best to be generous to others. You said once that you didn’t start writing until you were 55. For all of the aspiring writers out that who think they’re already so far behind, can you tell us any reasons why “waiting” to write paid off for you? There’s no “behind.” I promise you that. There’s right now. What you are doing right now, and that’s all. Katherine Hall Page once said to me—“I wish you had started writing twenty years ago, when I did. Then we could have come up through the ranks together.” Not that it wouldn’t have been wonderful—she’s amazing—but I said nope, it wouldn’t have happened that way. I am who I am now, and I’m the right person to write these books right now. How do you balance your busy full-time job as a TV news investigative reporter with writing fiction? Or is balance the wrong word? Ha. There is no balance. Cannot be done. There are choices, yes, choices every moment when we decide what’s important, and what’s necessary, and what “would be nice” and what is imperative. You do the best you can with what you can. Cooking was the first to go. Then sleep. Goodbye to exercise, vacation, dinner parties, movies. Is that “balance”? It’s a choice. Now I’m more careful to get exercise, and it has crossed my mind that it would be okay to take a vacation. That’s as far as I’ve evolved recently. What’s your best advice for our group of debut authors, just about to publish their first novels? What’s your best advice for writers who are still writing that first draft? Stop reading this and go write. Okay well, listen. You can come up with lots of reasons why you have other things you really NEED to be doing, and you’ll write later. But aren’t you unhappy when you decide that? Don’t you feel guilty and disappointed? And then—when you write—aren’t you SO proud of yourself? Why not do that? Why not make yourself happy and proud? Don’t fret about being a “bad writer.” You can fix it all later. Just write. You’re a reporter. What question do you wish we’d asked you—and then what’s the answer to it? How about—If we have questions, can we contact you? And the answer is: Sure! And oh! I just this second found out THE WRONG GIRL got a Reviewers Choice nomination for BEST THRILLER of 2013 from RT Bookreviews. So ask me if I’m thrilled! And you know the answer. GIVEAWAY! Comment on this post by noon EST on Friday, November 29nd, and you’ll be entered to win a copy of The Wrong Girl. Follow The Debutante Ball on Facebook and Twitter for extra entries—just mention that you did so in your comments. We’ll choose and contact the winner on Friday. Good luck! ← My 6 Degrees of Separation From … J.K. Rowling! Welcome, Hank! Thanks so much for joining us today! You’re answers are very inspiring. Thanks for being so generous! Also, do you have any promotion advice for folks like me, who don’t have budgets (or time off from the day job) for lots of travel? SOcial media is made for people with low budgets! YOu can travel anywhere in the world–right from your desk. Just–engage. If you are truly interested in other people, it’s not all about you, right? So you;re not being pushy or selling your book–because you;ll rarely even mention it right?–you’re just making friends. And making friends is a good goal. Thank you, Heather! SO lovely of you. Hope something in it helps…and keep in touch, okay? Thanks for the post. Even before I got to the interview question, I have wondered how you “balance” it all. I have seen guest posts from you at many of the mystery writers’ blogs I follow, not to mention responsibilities for MWA and SiC. Plus a fulltime career and family. I love what you said about it not being about balance but about choices. I work with numbers and when I talk to people about budgeting, I say exactly the same thing. It’s all about choice. And even though that can feel overwhelming at times, it is also very empowering because it is in your control. I hope someday to cross paths with you at a conference and get one of those bookmarkers! And I’ll be happy to end you bookmarks! Just let me know here.. message me on Facebook! And hope to see you in person, too..
Hank, you are so inspiring. Not just that you do it all, but that you do it all well. And especially this book. I am halfway through The Wrong Girl, and think it’s your absolute best. I find excuses to sneak off and read it–instead of doing what I should be doing. 🙂 That’s the sign of a good book! Sneaky reading is the best! Thanks for being our guest today, Hank! It was great talking to you, as always. I love the “every single event” “every single person” advice. It’s like life, no? Thanks for joining in, Hank. Thanks, Sal. And yes–we so often live for whats happening NEXT, and lose focus on what’s happening NOW. xoxoo Hope our paths cross in person soon! Hank, what a great interview! You are really an inspiration. I spent a lot of time with the “I wish I’d started 20 years ago, I’m too late,” but then I met you and it was, “Hey, it’s not too late.” As you say, if not now, when? I also love bookmarks. I made some for my middle-grade series and I leave them everywhere! I don’t know how they translate to sales, but I hand them out and people are always interested. And I love that you said “don’t obsess over Amazon rankings.” I started down that path too, and quickly realized that way lies insanity. And how fabulous about THE WRONG GIRL! Totally deserved! Hank, you are one of the most generous people I know. This is timely since I sent my manuscript in last week. I’m now chanting: Have fun, have fun! Great advice, Hank, of course I still love Prime Time and all your Time books, and I own an autographed copy of The Other Woman. I find it incredible that someone with 30 Emmys and myriad other awards ever worries. Guess that’s what we admire about you–your humanity! Thanks for the advice. It’s wonderful! Oh, Donnell…thank you! And we all worry, right? We just have to remember there’s a difference between worrying–and planning. Only one is productive. xoxoo Hope all is well with you! This is a fabulous interview. Incredibly helpful to me and my perspective as a new writer. I wonder about all of these things. I obsess over some of them. Probably the worst is my age at discovering fiction and realizing I wanted nothing more to do with academic writing. But I am old old old—too old I thought—but must do it anyway. So I love this interview and the debutantes. A wonderful spot on the writing world! Thanks, Reine! Never too old to start writing, seriously. Do you have to do pull-ups to write a book? Run a marathon? Nope. Here’s one secret, though. I PLAN my worry. Yes, indeed. If I have to give a big speech in three weeks, for instance, -I’ll tell myself: Im not going to worry about this every day. I’ll worry about it starting next Tuesday. And until then, I’m forgetting about it. I put it on the calendar, and then leave it. Do what has to be done TODAY. It really works. Thank you, Hank, for this inspiring post! As a debut novelist, it’s hard not to get swamped by sales numbers, so I especially loved your message about celebrating accomplishments and enjoying the chance to meet people. These are wise words: “…being worried and frantic is worthless, destructive, energy-sucking, and silly. Drove myself crazy with Amazon rankings and numbers. Whoa. That way lies crazy city. I wish I would have remembered to have more fun.” Yes, yes, yes! I’m taking this to heart. I enjoy your books for the strong narrative line and the characterizations. I respect them for the way you use your experience as an investigative journalist to enlighten readers on serious issues. One thing I discovered in promoting my debut novel is that I go to writers’ conferences with a different perspective, that of a marketer. Conferences have become work. The plus is that I meet more people because I force myself to be more extroverted. You have to be to pass out all those bookmarks and give individuals that 15-second pitch. I’ve also looked for more opportunities to speak to readers. Preparing for panels, workshops (mostly for people hoping to publish), and presentations takes time away from writing the next book, but readers’ feedback encourages me to choose to give writing a priority over things like travel in a way nothing else does. And yes, all the travel and the conferences–which I think is very important–can be detrimental to our writing! Remember that your book has to come first okay? I know it’s a complicated calculation, and I think of it very day. But it’s okay to remember to focus on that next book. And you are so right–something has to go. But it’s all worth it, right? And conferences are “fun” work, at least. LOVE this interview. Hank, you’re an inspiration! Is there an original way to say you’re an inspiration, Hank? Because I feel like I’m repeating the same thing over and over again! :-). But seriously, you truly are. Your passion, energy and intelligence are, well, awesome, if I can go a little SoCal on ya. This is great advice and I will harken back to it on a regular basis as my own journey unfolds. Thank you. My pleasure, dear Ellen. So lovely of you…and see you soon, I hope! Are people having trouble with the password thing? This is a test email. Sorry for the delay, folks. Some of your comments were being held hostage by our site! If you don’t see your comment now, try again, as everything has been approved at this point. A most informative and interesting interview. Congratulations and best wishes on your wonderful career, awards and writing. Such talent and strength. Thank you so much for the wonderful interview, Hank! I love how you mention you take a moment every day to realize how lucky you are. Recently at a conference, I met a writer who offered me similar advice. He said the best thing you can do is always practice gratitude. I couldn’t agree more. Oh, Natalia, thank you. Yes, it’s such an interesting thing to do…every time you take a moment to remember the good parts, the annoying frustrating frightening parts seem to fall away. And then–we remember why we loved it in the first place. Hank, I loved that you said you wrote Prime Time at just the right time in your life and career. That’s how I feel about my first novel. It came to me at 60 and I’ve don’t regret the ‘late start.’ It’s never too late and sometimes you need some history behind you to delve into your own past or to have the experience to tell the right story the right way. I have to pick up the rest of the “Time” books and read those. I’m enjoying The Other Woman (yes, I’m woefully behind as I bought it and had it signed by you last year!) and eager to move on to The Wrong Girl. You have a great style that pulls the reader right into the thick of it. And 60? Perfect timing. Think of all the things we know now that we didn’t 30 years ago! Good luck with your writing! Going to make some bookmarks to carry with me. Lots of great advice here. Love this! My favorite part? Have fun and be grateful. So funny, because I was cleaning off my desk a couple of hours ago and found that bookmark, and now here you are again! I can vouch for the effectiveness of that promotional tool. And happy thanksgiving to all..xooo I am off to wash brussels sprouts!